Could the book club break up? When Jess is offered an anonymous scholarship to a prestigious boarding school, she's not sure that leaving home—and her friends—is what she wants to do. 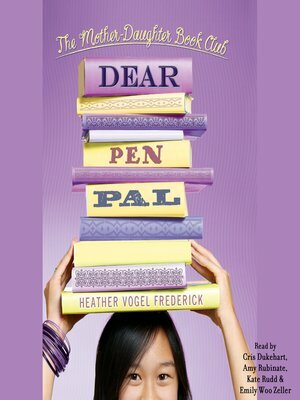 Meanwhile Megan's grandmother comes for a long visit and turns everything in the Wong household upside down; Emma crusades against her middle school's new uniforms; and Cassidy finds out there's a big change ahead for her family. Inspired by Jess's unexpected opportunity, the book club decides to read Jean Webster's classic Daddy-Long-legs, and there's an added twist this year when they become pen pals with the girls in a book club in Wyoming. There's plenty to write to their new friends about, from a prank-filled slumber party to a not-so-secret puppy—and even a surprise first kiss. In this third book in the beloved Mother-Daughter Book Club series, the girls learn that as long as they have one another—and a good book—they're ready for whatever eighth grade has in store!